Kentucky born poet, novelist, journalist, Pulitzer prize winner, Robert Penn Warren will be listened to as the average Northerner with comparable acceptance would not. And what has he to contribute? 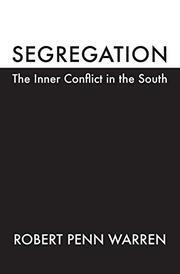 He went back to the Deep South; he talked to Negroes, to whites, on both sides of the issue. He listened, with understanding of the deep inner splits that made kindly men turn bitter and violent, in opposition to what they felt was happening, was going to happen. He comes up with no conclusions, but somehow what he has to report clears some away of the cobwebs. One begins to see that for the most part, the aggressive opponents of desegregation do not represent the better element , but that those who know in their hearts that it will come , prefer to stand aside than to fight on either side. One feels that Warren himself accepts the difficulties as a tragic slowing down process, possibly even a set-back to what might have come anyhow, but feels that the "creeping progress" goes on. And he recognizes- as he turns North-a vast sense of relief at escape from responsibility, from the divisiveness that characterizes the Southerner.